Prelink for MotionBuilder is a plug-in that allows Autodesk MotionBuilder to transmits animation data transforms over the network into a Previzion system for real-time character and object animation. 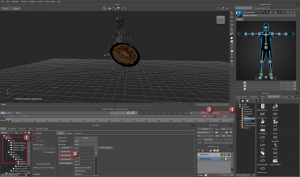 This enables any motion capture system that integrates with Motion Builder to be used with Previzion, and take advantage of Previzion’s frame-accurate time sync and optically matched renderer. We currently support MotionBuilder 2010, 2011, 2012, and 2013. Prelink is a plug-in for MotionBuilder that transmits animation data transforms over the network. 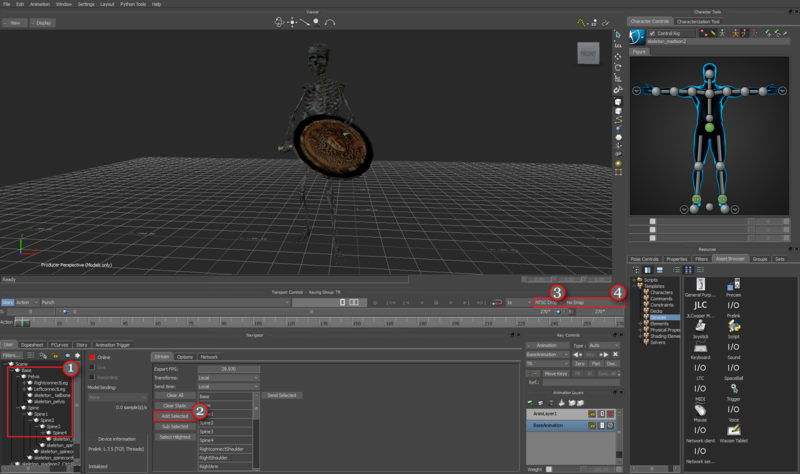 This enables any motion capture system that integrates with Motionbuilder to be used with Previzion, and take advantage of Previzion’s frame-accurate time sync and optically matched renderer. 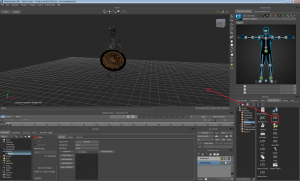 Download Prelink for Maya/MoBu 2011 from the Dashboard. Download and install the hardware protection key installer. Place the Prelink plugin in the C:\Program Files\Autodesk\MotionBuilderxxxx\bin\win32\ plugins directory. Download Prelink for Maya/MoBu 2012/2013 from the Dashboard. Unzip the folder and run the InstallPrelink2012x64.exe. Follow the instructions to install Prelink and Precam. 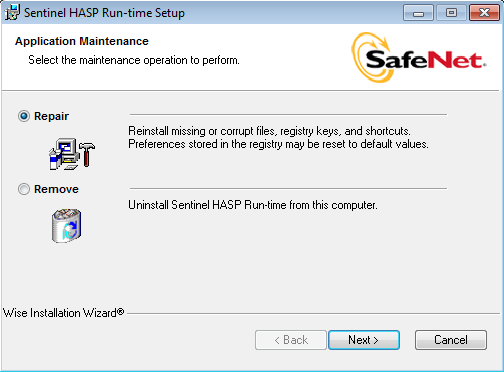 Use the Repair setting for the HASP Run-time Setup. 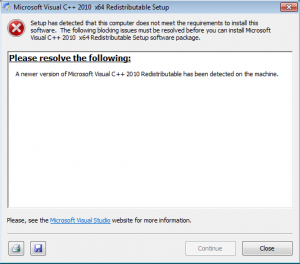 If you get a Redistributable Setup error, disregard and close. 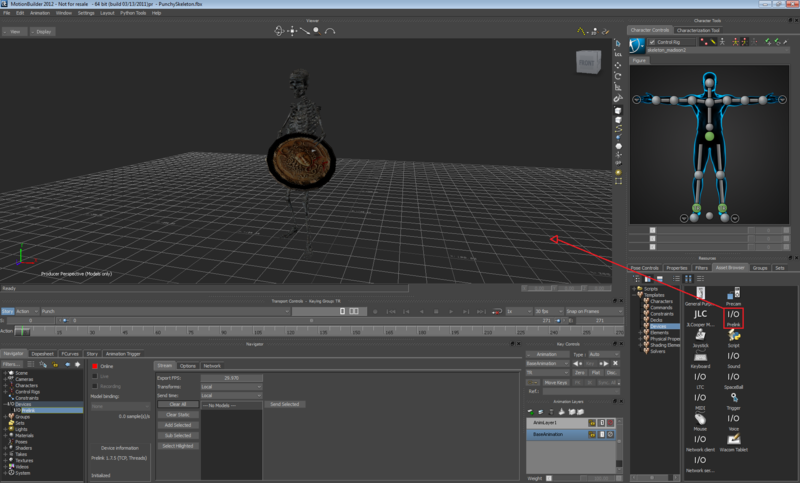 The connection from MotionBuilder to Previzion is achieved through the Prelink plugin. 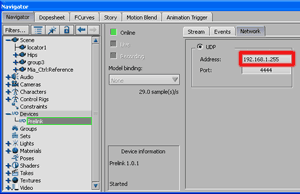 To use: Drag and drop the Prelink plugin from the Devices tab in Motionbuilder’s Asset Browser into the scene. In MotionBuilder’s Navigator window, select the desired joints and transforms in the Prelink model list (1). Then choose Add Selected (2). Note: Prelink sends each transform as a local transform, so all transforms between the root scene node and the character must be dragged into Prelink to match character scene motion between MotionBuilder and Previzion. Set the Export FPS to match the camera speed, in the Stream menu. Set the timeline frame rate to the correct frame rate (3). Set the frame interpolation to No Snap (4). To move individual scene elements around, select the object and click Add Selected in the Prelink window. After moving the object, click Sub Selected to remove its transform from the list being continuously updated. Click on the node in the list to highlight it, then click Select Highlighted. 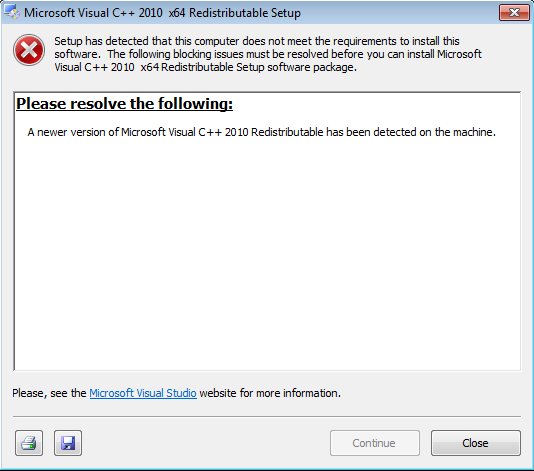 Click Sub Selected to remove the selected node. Change to the Communication tab in the Prelink UI. Change back to the Stream tab, and click the Online square. If both machines are on the same network, and the IP address was correctly entered into the previous step, the light will turn green and the link will show up in the Previzion Systems tab. To embed the time code of the current frame into the data packet, select Send Time->Local in the Prelink Stream tab. To set Motionbuilder into displaying the current frame in timecode mode, right click on the Timeline, and select Time->Display as Timecode. The incoming timecode frame from Prelink will be displayed in Previzion next to the incoming video timecode with the label Animation, and will be written into the take file.